Welcome to the GIS Services webpage. The GIS Services at the Alkek Library is here to serve and assist with the geospatial needs of its patrons: students, faculty and staff of Texas State University as well as interested members of the San Marcos Community. Support (in the form of guidance or directions) for GIS data-related coursework, research, and teaching. Guidance for research involving geospatial techniques. For example demonstrating how to locate and access spatial data sets; helping with geospatial analysis, map making and converting data to other formats. Guidance on data management best practices. Public service via in-person consultation, chat, phone, and email on geospatial needs. Periodic workshops and classes on basic geospatial techniques. Extended assistance with the completion of course assignments or theses/dissertation research. Patrons needing such assistance are strongly encouraged to consult with their faculty and/or TAs for further clarification and help. Creating and/or printing complete maps. Extended or comprehensive training in the use of geospatial tools including both hardware and software such as GPS and ArcGIS software suite. For such needs, please explore these learning GIS at Texas State options. GIS is the acronym for Geographic Information Systems which simply stands for a computer-based system for the compilation, management, analysis, and display of geographic information. The system comprises mainly of computer hardware and software, geographic data, procedures or techniques and skilled personnel. In GIS, real-world features captured as data are represented as either vector or raster (imagery) formats. These geographically-referenced data are often associated with some extra descriptive information described as attributes. A GIS application displays datasets as layers; each layer represents a particular feature of interest captured from the real world: eg. buildings, transport networks, population, political boundaries, rivers, elevation etc. A GIS analysis essentially is based on either the geographic relationship among the layers or their attribute information. For some basic tutorials or a general overview of GIS, you may visit The Beginner's Guide to GIS. 1. Efficient decision making. GIS provides efficient ways in deciding where, how and why to locate facilities or services. This is important because the suitability of a location for a facility or service is key in determining such feature's success. GIS has been widely used in making decisions concerning issues like zoning, community planning, resource allocation, health-care access, conservation, route selection/planning etc. The efficiency brought into decision-making processes ultimately leads to huge cost saving outcomes for both government entities and private corporations. 2. Better communication of information. The ability to visualize geographic data with their associated attribute information through GIS also enhances people’s understanding of locational problems. GIS can be used to display geographic data and also maps. 3. Cost efficiency. The comprehensive nature of GIS (several separate functions put together) helps cut down the cost of acquiring various tools or functions. A myriad of separate analysis can all be carried out within a single GIS platform. This advantage eliminates extra financial or time cost that may be incurred in procuring tools for each separate analysis. 4. Better data management. GIS offers a relatively easy way of manipulating, managing and storing datasets. For example, data can be edited, queried, integrated or merged, copied, categorized and even converted into other formats within GIS. These capabilities enhance productivity. Agriculture: conduct capability / suitability analysis for certain crops. Archaeology: map and also find potential archeological sites. Biology & Wildlife: determine or predict potential habitats of certain plant and animal species. Criminal Justice: conduct crime hot-spot analysis. Engineering: determine best locations for building facilities. Health Administration: analyze spatial patterns of a disease outbreak or a health issue. History: map or reconstruct historical events. Marketing: determine coverage areas of businesses, map market segments and estimate market shares and sales potential. Mass Communication & Journalism: analyze geographic patterns of social media data. Political Science: assess voting patterns and make predictions. Sociology: analyze social inequalities in the distribution of social services and facilities such as health centers and food banks. The maps were judged based on Design/Layout (organization & balance), Legibility & Visual Appeal (text font/size, color coordination & use of symbology), Effective communication (understandable & efficient use of techniques and data), Accuracy (grammar & spelling), and Originality (unique presentation). 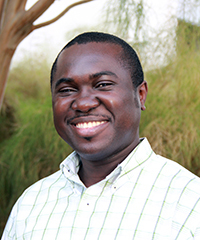 Nathaniel Dede-Bamfo received a Ph.D. in Geographic Information Science from Texas State University. Nathaniel is a passionate academic with over ten years’ experience in teaching and research particularly, in the field of Geospatial Science. His research interests include Geospatial Modeling, Spatial Accessibility and Mobility, Sustainable Rural Development and Geography of Sub-Saharan Africa. Nathaniel enjoys meeting people and sharing ideas.